Every business, every organization, survives by telling its story. If you learn to tell a good story, you can persuade more people, sell more products, raise more money — in short, do a better job at whatever it is you need to do. Today, in the era of content marketing, the advertising and public relations field has experienced unprecedented growth as more and more organizations recognize that their continued existence depends on building successful relationships with their audiences through communications. If you dream of putting your creativity to work in business, non-profits, the arts, education or any field you can imagine, a B.A. in Public Relations and Advertising from Chapman University’s Dodge College of Film and Media Arts is a great place to start. At Dodge College, you’ll learn all aspects of planning, developing and executing effective communications campaigns while mastering the most powerful medium of our time — film. We offer a unique degree in a unique setting. Our program brings together public relations and advertising, two disciplines that always work together. Starting with an integrated core, you can then specialize in either PR or advertising, or study both. Either way, you will understand the many avenues and message types organizations use to communicate. Uniquely positioned in Dodge College of Film and Media Arts, you will learn to use all kinds of media tools and communicate effectively using the visual media that dominate communication and marketing today. Hear from guest speakers from every conceivable business and organization. Join student professional organizations like the Public Relations Student Society of America (PRSSA) and the Chapman Ad Club. Compete in the Bateman Case Study Competition and the American Advertising Federation’s National Student Advertising Competition. Intern with major corporations, PR and advertising agencies, non-profit organizations, Hollywood studios and event planning firms. And you’ll graduate with a comprehensive public relations or advertising campaign, an entertainment marketing plan and a social media portfolio to open doors to your first job. Develop effective written, oral and visual communication skills. Understand the strategic differences between and the varying tactics employed by public relations and advertising and be able to apply them within a comprehensive public relations or advertising plan. Be able to think critically about the economic, social, technological, political, persuasive and ethical factors that affect PR and advertising decision-making. In FTV 130E Intro to Visual Storytelling for Public Relations and Advertising and FTV 140/140L Introduction to Film Aesthetics/Lab you will learn the basics of how we use image and sound to communicate ideas and stories. In Com 210B Theories of Persuasion for Non-Majors, you will learn what motivates people and how you can apply persuasion in your life and your communications. can take PRA 230 Principles of Advertising and PRA 231 Principles of Public Relations, each of which will introduce you to the many facets of these fields, from the role of advertising in marketing to the many audiences addressed by the public relations function. In these introductory classes you will also be asked to step outside of the classroom and write Professional Development papers based on your attendance at presentations by industry professionals in advertising or PR, typically at a meeting of the Chapman Ad Club or the Chapman chapter of the Public Relations Student Society of American (PRSSA). These opportunities will give you an expanded view of the work in these fields and the career paths open to you. Armed with this knowledge of the foundations of visual communication, persuasion and the basic activities of people involved in PR and advertising, you will be prepared for the more intense study of MKTG 305 Fundamentals of Marketing for Non-Majors, where you will see how PR and advertising work together in support of the marketing function. In PRA 305 Design Strategy you will learn about the strategy behind the design of print and online communications—you learn to create the tools that will serve you in your senior level classes. PRA 370 Digital Marketing will build on these classes and bring in the use of social media as part of the communications mix for marketing, advocacy and community-building purposes. As you move through the program, you will probably have decided that you lean more toward PR or more toward advertising. That will guide your choices between PRA 343 Media Relations, where you will learn about pitching and working with the media to get coverage for your clients, or PRA 344 Media Planning and Buying, where you will learn how to create a media plan for an advertising campaign that spans a variety of media. In PRA 371 Writing for Public Relations you will learn to write the various forms of public relations copy—news releases, features, speeches etc.—or in PRA 373 Copy Writing you will focus on writing advertising copy. As you near the end of the program, you will be prepared for the intense, in-depth study of either PRA 461 Case Studies in Advertising or PRA 470 Public Relations Case Studies where you will study the best and the worst examples of corporate behavior and communications and write an original research paper on a case of your choosing. In PRA 497 Advertising Campaigns or PRA 498 Public Relations Campaigns you will be part of a team that creates an entire campaign—from research through developing a complete campaign plan to creating the supporting creative tools—for a client. In PRA 419 Entertainment Marketing and Promotion, you will employ many of those same tools in the very specific task of creating a campaign for a film created by another Dodge College student, bringing together all that you have learned and applying it in the area of entertainment marketing. Whether you intend to enter the entertainment field or some other, you will find this culminating experience a worthwhile challenge that will result in a portfolio piece of which you can be proud. You may also choose electives that support your area of interest, or, through the major requirements or your electives, you may mix and match, supporting deeper learning in both public relations and advertising. The B.A. in Public Relations and Advertising prepares students to perform creative and strategic work in any type of business, in the entertainment industry or in the non–profit arena as well as for public relations, advertising, marketing or social media agencies. In a media environment dominated by storytelling and engagement, students learn to use the visual tools of film and television as well as print, social media and the Internet to create conversations and pursue organizational objectives. 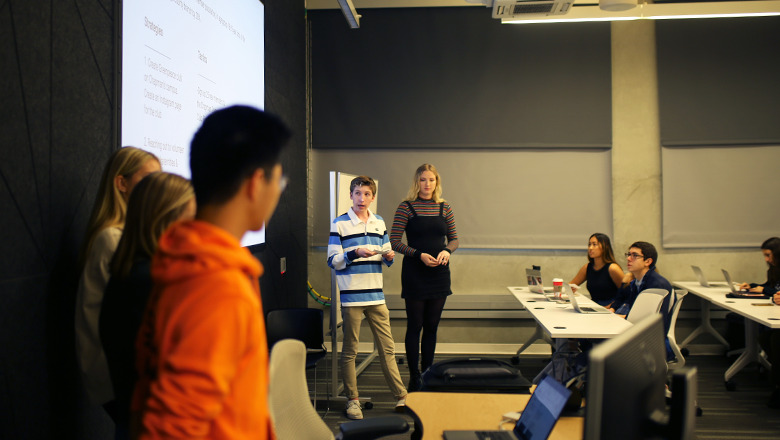 Following coursework introducing students to both fields, students may choose their elective courses to pursue a focus in either public relations or advertising. Program Learning Outcomes and Educational Effectiveness Evaluation Plans for B.A. in Public Relations and Advertising. Complete the senior project requirement, PRA 497 or PRA 498. Students enrolled in the Public Relations and Advertising Program gain hands-on experience from a variety of organizations. Over the last two years, PRA students have interned with more than 200 different organizations. Click on the links below to learn more about some of the organizations where they have interned. If you know what you’re doing, your time at Chapman will be incredibly rewarding. Here are some tips on internships, graduation, studying abroad, and more, to help things go more smoothly. View a sample of public relations, advertising, and entertainment marketing campaigns created by the students in the Public Relations and Advertising program.